New York, NY — While the world of celebrity watchers and the mainstream media look to MARK GERAGOS as a high-powered trial attorney and legal sage, he is all that and much more to the Armenian people. The internationally acclaimed trial lawyer and Principal of Geragos & Geragos has somehow managed to take time from his demanding schedule in court and in the media to advocate for some of the most important causes and interests of the Diaspora and the Armenian homeland. Armenia Fund is on his short list. On September 29, 2012, Mr. Geragos will take center stage at Gotham Hall in New York City as master of ceremonies of the Armenia Fund USA gala, celebrating 20 years helping to bring Armenia and Karabakh into the 21st century. No doubt, he will be making some very convincing arguments for why Armenia Fund USA has cause to celebrate and why Armenians should continue to support its mission, programs and projects. This is not a one-night-only performance. Later this year, Mr. Geragos will preside over the 12-hour long Armenia Fund Thanksgiving DayTelethon for the 10th consecutive year, putting his magnetic imprint on what has come to be a tradition within a tradition for many Armenian-American families. They tune in to watch Mark use his formidable powers of persuasion to keep the phones ringing with new donations from across the country and abroad. His in-depth knowledge of Armenia Fund can also be attributed to his service, since 2006, on the board of trustees of the Hayastan All-Armenian Fund, the central umbrella organization of which Armenia Fund USA is an affiliate. Mr. Geragos had graciously accepted to host the Gala as a tribute to Armenia Fund USA’s special status. It is the first of the now 22 international affiliates, formed at a time when Armenia and Karabakh were reeling from all the challenges testing the very survival of these newly independent states. Armenia Fund USA had to bring to bear all the ingenuity, know-how and related experience that its founders and members could muster to help bring back both Armenia and Karabakh from the brink. During the dark days of the economic blockade of Armenia and the escalating hostilities in Nagorno-Karabakh, the resources of the fledging independent republics were drowning under the weight of the unfolding humanitarian crisis. The institutions of the now-defunct soviet system left a huge vacuum for new systems and structures to fill. 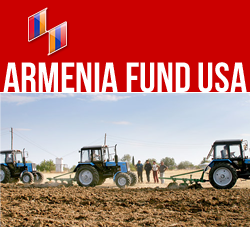 Armenia Fund USA was the first to come to the rescue, with an airlift of fuel, food and medicine made possible with the cooperation of the United Armenia Fund. It also took the lead in some of the most groundbreaking infrastructure projects that fundamentally changed the anatomy of the country with the Goris-Stepankert highway, connecting Armenia and Karabakh, and the North-South Highway, linking all the major towns of Karabakh. “The impact of these civic projects on national security and economic development cannot be overestimated, “says Khoren Bandazian current chairman of board of directors of Armenia Fund USA, formerly its secretary for eight consecutive years and chair of the event committee of the organization’s 15th year anniversary gala. “We are very proud to have Mark Geragos hosting our milestone celebration,” he added. “We know his passion for Armenia and Armenian causes isn’t just words. He is actively engaged in some of the biggest issues of our times, bringing his highly visible presence into arenas that need his special brand of intellect and skill.” Mr. Bandazian was clearly referring to Mr. Geragos’ heroic work on genocide issues. Mark Geragos was one of the lead lawyers in a pair of groundbreaking Federal Class Action Lawsuits against New York Life Insurance and AXA Corporation for insurance policies issued in the early 20th century during the genocide of over 1.5 million Armenians by the Ottoman Turk Regime. These two cases have settled for close to $40 million. Currently, the issue of his other lawsuits seeking damages is before the U.S. Supreme Court, but a U.S. Federal Court ruled that “Armenians did not have the right to sue against foreign insurance companies for unpaid claims because the U.S. government does not legally recognize that an Armenian genocide occurred.” Such an outcome only compelled Mr. Geragos to escalate his efforts. Most proudly, he is currently suing the government of Turkey itself for reparations arising out of the Armenian Genocide. If such a noble pursuit of justice were not enough for this super-lawyer, he is also on the Advisory Committee of Birthright Armenia and is chairman of the Armenian Bone Marrow Donor Registry. He is also involved with the Armenian religious community. Mr. Geragos’s cemented his national reputation as a trial lawyer fourteen years ago with back-to-back State and Federal Court jury trial acquittals for renowned Whitewater figure Susan McDougal, the former business partner of former President Bill Clinton. In early 2001, Geragos completed his representation of McDougal by securing a presidential pardon for Ms. McDougal for a conviction she sustained prior to his representation of her. In March of 2006, Mr. Geragos won a dismissal of special circumstances murder charges after he was able to prove that the eyewitness identification of his client was fatally flawed. The client was freed from custody after being held without bail for over eight months. This dismissal came on the heels of another exoneration of a Geragos client who was freed from custody and his case dismissed by the prosecution after DNA tests conducted by the defense proved that he also had been falsely accused as a result of a flawed eyewitness identification. That year, Mr. Geragos was awarded the prestigious “California Lawyer of the Year Award” in Civil Litigation for his groundbreaking work involving these lawsuits. In addition, he has previously been named “Trial Lawyer of the Year” by the Los Angeles Criminal Courts Bar Association, making him one of only two lawyers ever named “Lawyer of the Year” in both the Criminal and Civil arenas, the other being Johnnie Cochran. California Law Business Magazine named Geragos as "One of the 100 Most Influential Attorneys in California" three years in a row, and Mr. Geragos has been voted by his peers every year as one of Los Angeles’ Super Lawyers. Additionally, he won dismissal of prostitution charges against the internationally renowned James Bond movie director, Lee Tamahori. He successfully won dismissal of all felony charges, including kidnapping and torture, for his client, Hung Bao Zhong, the recognized exiled leader of the shadow government of China, who has an estimated 38 million followers worldwide. Geragos represented the Dhaliwhal brothers, the surviving victims of the 2007 tiger mauling at the San Francisco Zoo and won a million dollar settlement in that case. In 2008, Mark Geragos won dismissal of murder charges for the third time for a USC co-ed charged with murder in the death of her fetus. That same year, he also won the dismissal of a twenty-seven-year-old murder charge against Japanese national Kazuyoshi Miura, a case which mesmerized the Japanese media and was labeled the “Japanese O.J. Case.” In December of 2008, he secured for his client, a non-profit foundation, a $59 million jury verdict in Santa Clara Superior Court in a trade secrets case against pharmaceutical giant Pfizer Corporation. That verdict was voted both “Top Ten Verdicts in 2008 in California” by the Daily Journal, as well as “Top Fifty Verdicts in the United States” by the National Law Journal. Mark Geragos’ client list has included singer Chris Brown, Nicole Ritchie, former Congressman Gary Condit, former first brother Roger Clinton, Academy Award-nominated actress Winona Ryder, pop star Michael Jackson, hip hop stars Nathaniel “Nate Dogg” Hale and Sean “Diddy” Combs (fka Puff Daddy), Usher Raymond, Mike Tyson, and the Sarkisyan family, whose seventeen-year-old daughter died when Cigna Corporation refused to authorize a liver transplant. Over the last fourteen months, he has won all eight jury trials he has tried, including a stunning $8 million bad faith verdict on behalf of a 90-year-old World War II veteran. For several years, Mr. Geragos represented Barry Bonds’ personal trainer, Greg Anderson, in his matter relating to the Federal Investigation into steroid use in Professional Sports. Mr. Geragos regularly appears as both guest and legal commentator on the "Today Show," "Good Morning America," "Anderson Cooper," "Dateline NBC," "60 minutes," and “48 hours,” and has lectured extensively and authored numerous articles and Law Review publications on the subject of Media and the Law. Also appearing as featured gala participants along with Mr. Geragos are H.E. Eduard Nalbandian, Armenia’s foreign minister and French-Armenian pop singer Patrick Fiori in his New York premiere performance. For more information and tickets, contact Armenia Fund USA at 201-639-3985 conveniently order them online by credit card. Or, call 201-639-3985; toll-free at 866-446-6237. Those who have received printed invitations by mail are encouraged to RSVP no later than September 15, 2012.